Brunch | Does it come with bacon? While I didn’t make it out to Happy Hour this week, I did get a chance to enjoy breakfast at Toulouse Petit this morning. And since their entire breakfast menu is available at Happy Hour prices ($7 for most items) Monday – Friday from 9am – 11am, I’m counting this as my ‘happy hour’ review of the week. So you get a brunch/breakfast review and a happy hour review for the price of one! My friend Lillian and I met at Toulouse Petit at about 10:30. It was a bit full, but we were seated within 10-15 minutes. Bigger groups will definitely have a longer wait on the weekends, but a small group of 2-4 shouldn’t have too long of a wait. We kicked things off with some cocktails. Lillian ordered the mimosa, and I went with the Breakfast Flip (navan vanil, bakon vodka, irish cream, maple syrup) since I’d wanted to try a cocktail with Bakon Vodka! 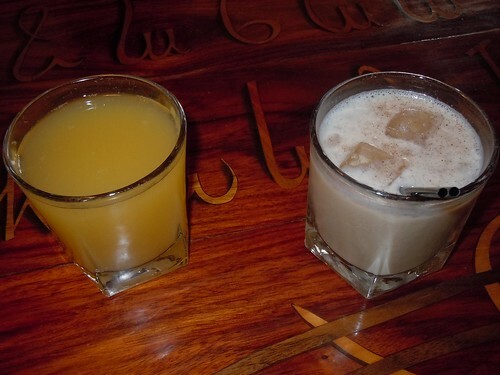 The drink was quite tasty, reminiscent of a white russian without the heaviness. I couldn’t really get much of a bacon flavor, but tasted more of the maple and vanilla flavors. All in all, a good drink to order in lieu of a white russian. All their breakfast cocktails are $6.95 before 7pm, so it’s a decent deal. While I didn’t get it this time, the Madame Toulouse ’76 (Finlandia grapefruit, sparkling wine, peach puree, honey), a play on the classic French ’76, is another fantastic breakfast cocktail I’d definitely recommend. I’m not a grapefruit vodka fan, but the combination of ingredients really balances the grapefruit flavor. After a good 10 minutes debating what to order from the impressive breakfast menu, the two of us finally made our choices. Lillian went with the Prime Rib Eye Steak and Eggs ($15, $10 during HH), while I decided on the Duck Confit Hash ($11, $7 during HH). I had a bite of the Prime Rib Eye Steak, and it was fantastic. It was lightly seasoned, so the flavor of the steak really shined through. 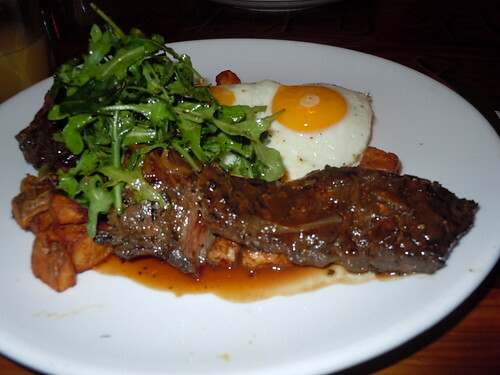 It was cooked medium rare and served with potatoes, arugula atop the steak, and two eggs (she ordered them sunny side up). Definitely a good choice for those who enjoy steak & eggs for breakfast! As you can see, it was a hearty portion of steak! 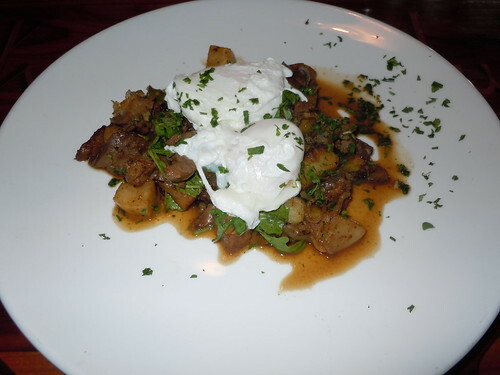 The Duck Confit Hash was definitely an excellent choice! It was in a Worcestershire type sauce that gave the dish just enough ‘bite’ as not to overpower the other flavors. I ordered my 2 eggs poached, which was (in my opinion) the way to go for this one! Each bite had a bit of the egg white, yolk, duck confit and either a potato, parsnip or piece of asparagus! It was also topped with arugula, which wilted just enough. It was a great accent to the dish! I have no complaints about this one. My only regret was that I didn’t have a piece of toast to sop up the sauce! All in all, an excellent Sunday brunch! I’ll definitely be back – so many menu items I’ve simply got to try. Check them out on Facebook, Twitter, and Yelp.